The kids will LOVE this craft! And you will love saving all that money on expensive wrapping paper! The best part about the holidays is being with the family. We love crafting and love making a day of it at home. I just love that Brent is getting old enough to join in on all the fun too. That’s why I came up with this fun holiday craft. It is great for all ages and can be as elaborate or not as you want! Most of us spend tons of money on expensive wrapping paper that all goes into the trash bin right after, but this craft is so much fun to create and makes receiving that present so much more special. Who won’t love getting a gift wrapped in paper made by the kids! I can already see Grandma’s face lighting up! 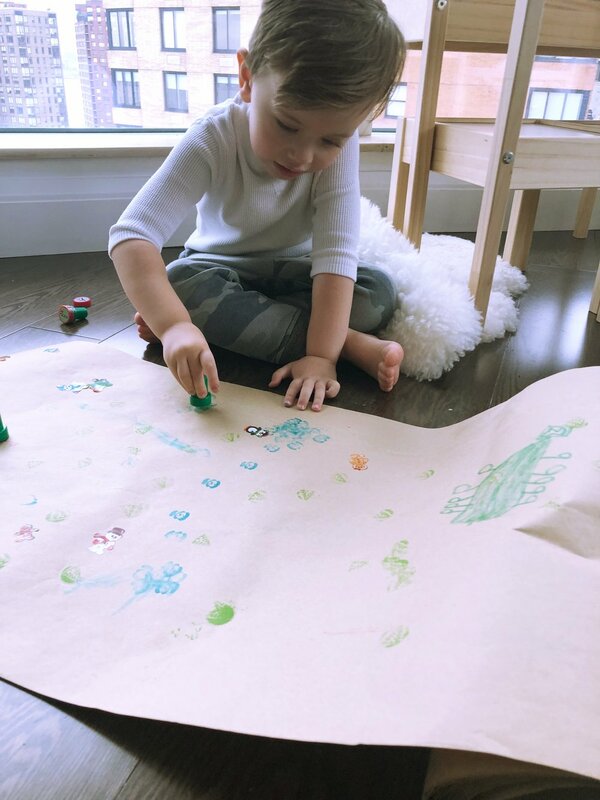 All you need is a large roll of butcher paper or craft paper, stickers, markers and stamps! You can also do glue and glitter if you want to add a little sparkle! I’ve been taking this craft along with me everywhere, from playdates to pre-dinner entertainment! The kids all love gathering around the large blank canvas and creating! To get started, simply roll out the large piece of paper. Make sure the kids have enough space to make a section it their own. Then put out the supplies all along the middle of the paper. The kids will gravitate toward what they want to use to make it their own. Give them options to mix and explore using the different materials. My daughter loved using the makers to write messages and draw holiday theamed shapes. Where Brent was more drawn to the stampers and stickers! How cute did it turn out!?! I also love having the kids help with the wrapping. We can’t wait to give out all our gifts with this special touch! Happy Holidays! 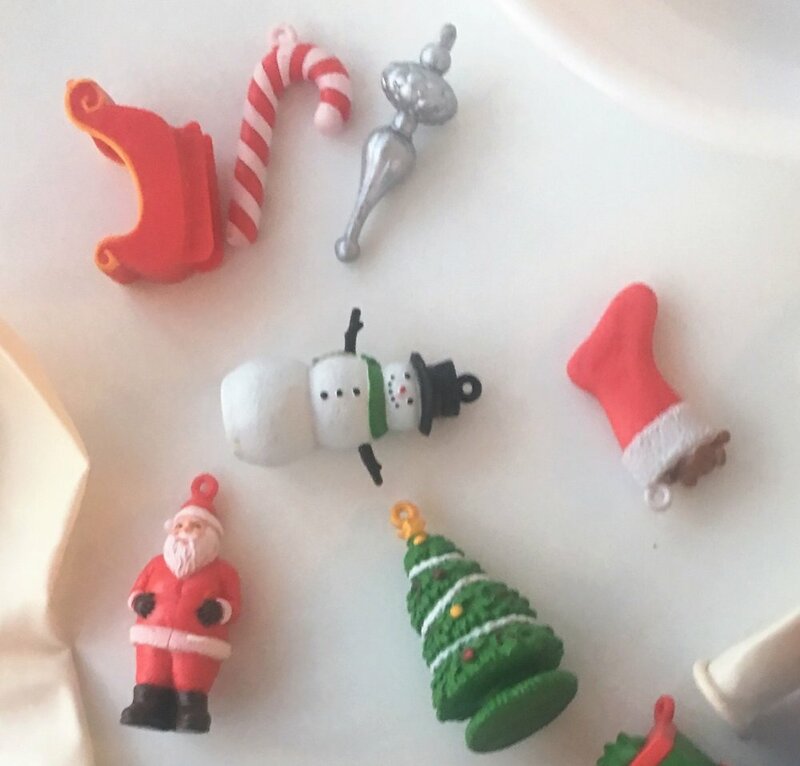 I thought I had an original idea when I planned this a few months ago… It started as a DIY gingerbread house and then turned to a tree when I realized that it would be way more fun for the kids to decorate and create each ornament. However, I have seen the pop up ads on social media for pre-fab kits for this. But be warned! The fun is in the creating! My kids enjoyed creating the ornaments and tree all by themselves! The joy and pride they have after creating something is so amazing to watch and if your family loves crafting like we do, then make it yourselves! It was so easy and will probably cost less. To begin this craft you’ll need to cut out the large Christmas tree. Fold the green felt in half. Then use the chalk and roller to map out the shape. Then use sharp scissors to cut out the tree. Place out the colored felt for the kids. Brainstorm ideas on what ornaments. This was the fun part! I helped them create whatever holiday shape that popped into their heads! From Rudolf to candy canes, we made them all! Then simply place one side of the velcro on the tree where you’d like to “hang” your ornaments. Make sure to put enough up for all the ornaments the kids have created! Spread them out so each one has room to shine! Then put the other side of the velcro on the backs of all the ornaments. Use the velcro dots or strips to hang the tree on the wall. I used a ton to get this to stick to the wall snug enough so the kids could play with with it and take the ornaments on and off! Such a fun interactive holiday decoration. Enjoy and happy holidays to you and your family! The star on top is my favorite part! One of our favorite things to do at home is crafting and with Halloween right around the corner I knew we had to do something fun and unique! My kids actually don’t love the taste of pre-packaged water so we are always using reusable waterbottles or jugs at home. The kids always bring their favorite one to school, the park or just to use at bedtime. 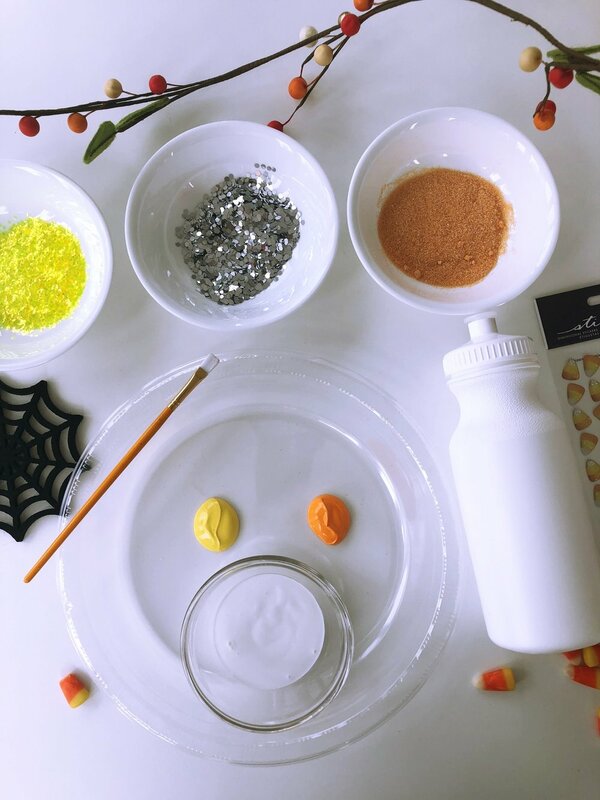 So we decided to make this fun craft to look just like our favorite Halloween candy, Candy Corn! And will use it all October long! First lay out a plastic lined table cloth to help with containing the mess. Glitter can get everywhere and this will help with clean up! Then, layout all the materials on a plate, I even added a cute little white pumpkin for them to decorate while they were at it! Plus, I of course had some yummy Candy Corn on hand to get them in the spirit! Then help them with the spacing of the colors starting with yellow at the bottom, then the middle section in orange and the top in white. The glitter can be sprinkled right onto the wet paint. They added their own personal touches such as writing their names, adding candy corn stickers and just the right amount of glitter, and finished it off with a thick coat of water proof Mod Podge. Let dry over night and clean properly before use. What could be prettier than pink and purple chocolate covered in glitter!?! Summer days call for tons of arts and crafts so I put together this fun do-it-yourself Unicorn Bark craft for Brinkley. It's fun and whimsical. Perfect for your girly girl! Even Brycen got in on the action. Who can resist a sweet treat, right?! Well, here is how to make this amazing creation! So easy and the kids will love it! First, start by covering the cookie sheet with tin foil. Then spray on the non-stick spray. Place the chocolate melts in separate bowls. Microwave melts until they are completely melted. I like to put them in for 30 second increments. Keep stirring them in-between the 30 second cook time until they are complete melted. Don't over heat the chocolate! Once the chocolate is melted, begin to layer in strips onto the cookie sheet. Use the spatula to combine the colors together gently wiggling the spatula to create waves in the chocolate. Try not to over mix. You want to see the colors and not combine them too much. Then use a fork to create spiraling patterns in the chocolate. Swirling the chocolate will definitely create a magical effect. Don't miss this step! The fun part is next! Adding the sparkle!!! Let your child have fun with this. Brinkley used the same color on each chocolate color. I love how this came out! Don't you?!! But this can be up to your little one to make it how they like! And taste testing is a must! Once your masterpiece is created, let the chocolate cool and dry. This should take less than an hour. It will become hard and here is when my son stepped in! To smash the large block into smaller bite-size pieces. My kids just went for it and dropped the chocolate block over and over again until completely broken. See how happy they are... Enjoy! I just love kid friendly crafts and what better time to make one than this 4th of July with this bright and colorful RED, WHITE & BLUE Sensory Rice Bin! If you have little kids or are just entertaining families who do, well, this is the perfect craft for you! Having a very busy toddler of my own, I am always thinking of exciting new ways to keep him entertained. But this craft is not only great for pre-schoolers. My7 year-old daughter got in on the fun too! Kids will just love this DIY craft and it is so easy you will love it too... it takes only minutes to prepare! First, start by measuring out your rice. I used 3 cups of rice. Then add 2 tbls spoons of vinegar. Start out by adding 7-10 drops of food coloring. Combine. Add more food coloring as needed. Let try for at least 1 hour. If you have time, let dry overnight to avoid any color from getting other hands. Repeat in separate bowl for different colors. Finally, add the rice in rows in a bin for the kids to mix and play with! Add fun sand toys like scoops and funnels. The kids will have blast with this! *TIP- To avoid a messy situation, use in the grass. The kids will inevitably pour some out of the bin during play time! If doing indoors, place a large mat under the bin for quick and somewhat easy clean up! Wait, what?!! No melt ice cream? Yes, it's true and the kids will love playing and rolling this mixture much like they would with actual playdoh! So, my kids have watched their fair share of youtube videos and this is something my daughter has been asking to make all school year long! Now that the sun is shining and we are spending our afternoons and even evenings outside enjoying the weather, I knew it was the perfect time to test out this theory! I haven't seen the videos that she's watched but I knew the mixture is pretty much icing (store bought) and a TON of confectioners sugar. What's not to love about that! Begin to mix in the confectioners sugar slowly. We used a silicone mixing spoon to combine but you can also do this in your stand mixer. Continue to add the confectioners sugar slowly until you get the desired consistency which is a thick non-sicky dough. The kids can then add in their favorite colored sprinkles. Get creative! Use what you have at home! Nonpareilles work great or even try an edible glitter available at most craft stores in the cake decorating isle. 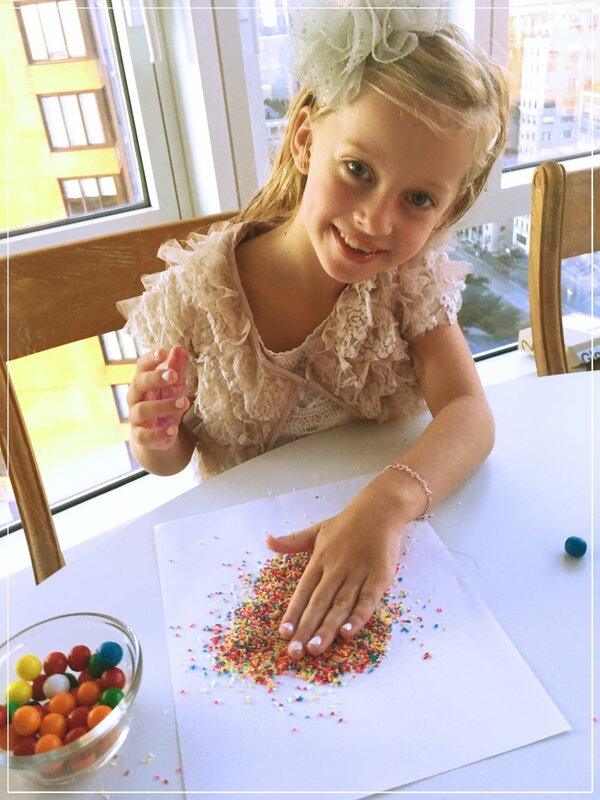 Let the kids play with the mixture, roll it around and have fun adding the sprinkles! *Note- to make colored dough don't add food coloring it will become too sticky, just buy colored icing and follow the same directions! Then, to enjoy this treat, we stopped onto colorful ice-cream cones! This is perfect for outdoor fun in the summer, birthday parties or barbecues so you can pre-make them and not worry about them melting! Everyone will love the fun and whimsy of this summery sweet treat! Love in the air! Set up a fun, beautiful and unique Valentine's Day craft that you will all enjoy! Why just make something to make it? Make a masterpiece with this stunning mix medium creation. Rummage through your craft bin and find some other items to add texture. We used heart shaped glitter, regular glitter and I picked up a jar of glass bead and crackle paste so when it drys the artwork has dimension. I supplied candies, stickers, rose petals and as many things I could find to aid in the creative process. You can also try pieces of tin foil, tissue paper or even actual sand to mix into the paint. Be creative! There is no right or wrong, just have fun and inspire your kids to try out other ways to create art. Tis' the season with this super fun DIY Snowball Surprise Toss Game perfect for the whole family! My kids are still obsessing over slime but what they didn't expect was to find a surprise inside! The winter can be long and keeping the kids excited and entertained isn't always easy. I knew I'd have to come up with a great way to make their 2 week long winter break a blast. That's why I created this ultimate slime surprise snowball toss game for them. With two older kids who are super active and a toddler, doing crafts for all ages is tricky. While Brent was napping we created the slime and hit a little holiday trinket in each balloon. Then we added the different slime colors in separate balloons creating our snowballs! I set up a little area in the apartment for them to play the game with two metal pails. Each pail was a different point amount. So once all our snowballs were made, they had a blast tossing them and for once it didn't matter who won! The had so much fun sqeezing the squishy snowballs guessing what they thought was in each one. And when were all done playing, I let them open each snowball to reveal the secret surprise inside! Brent loved playing with all the holiday figurines and has been carrying around the pails filled with them all weekend! Here is how to create this with your kids! Then, put the trinket or figurine into the balloon carefully not to puncture the balloon. Then add the slime into the balloon. You will only be able to add about a handful of slime. The best way we found was to have one person stretch open the balloon while the other places it in. Do this for about 8-10 balloons creating your snowballs! With the cardboard, make score signs and place inside each tin bucket. Set up a safe play area where they can toss the snowballs into the bucket. I used a soft white fur rug to stage the area for them. Watch them enjoy! Take score if they want and have the winner open his or her snowball first! We divided the balls evenly to keep everyone happy. Once the fun is over, after an afternoon or longer, have the kids open the surprise snowballs to reveal their prize! What a fun and beautiful craft to make this holiday season! Gather 'round the tree with this Christmas Scented Winter Snowflake Ornament DIY. Looking for the perfect gift for grandma or need to bring something to your neighbor's tree trimming party?! Try this simple craft that really makes a statement on anyone's tree. With the added festive holiday scent, it will bring joy all around. A perfect craft for those cold wintery days. First, hand out a small portion of the clay to everyone. Then use the molds or cookie cutters to make the shape. Each snowflake is unique and so should these ornaments! Carefully remove the snowflake! Then use a small drop of glitter glue and use the paint brush to gently coat the top and sides with glue. 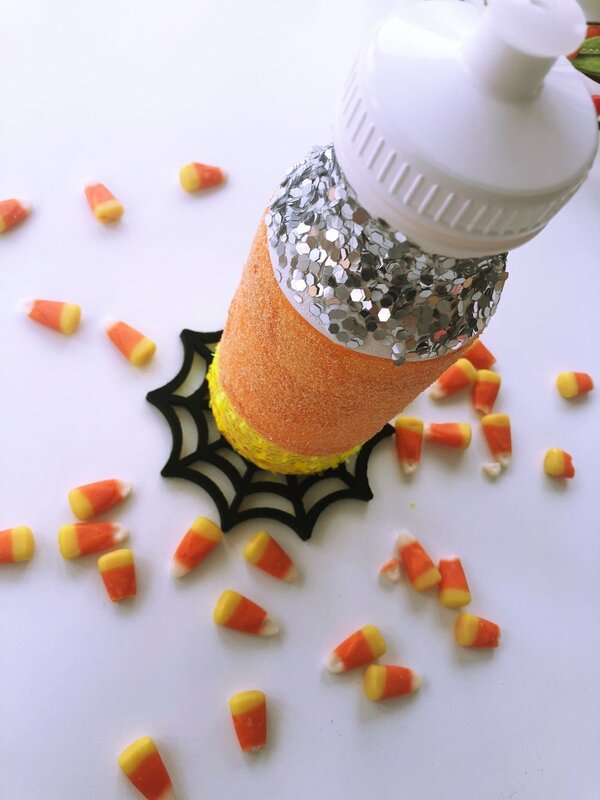 Let the kids get creative by sprinkling on their own choice of shimmery glitter. Or try this beautiful faux sugar crystal sprinkles that I found! They look so good you'll almost think they are real sugar! I also love these little styrofoam balls I found in the DIY slime aisle at Michaels. They add the perfect touch and look just like falling snow. To make this ornament super special and unique we added a few drops of Christmas Wreath scented oil. Who doesn't love the pine tree scent at Christmas time. It fills the room with true Christmas spirit! 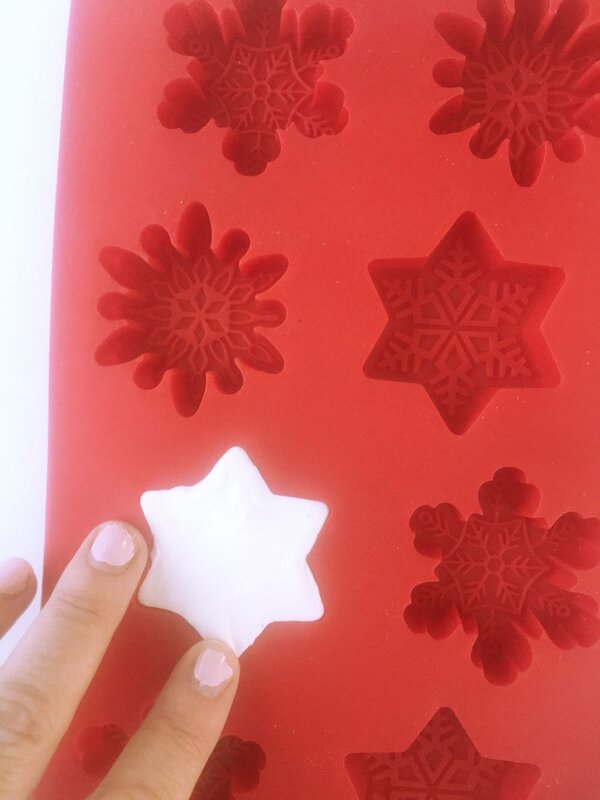 Use the pointy end of the paintbrush handle to poke a small hole in the snowflake. Simply string a thin white satin ribbon to pull this DIY craft all together creating the perfect shimmery snowflake to hang from the tree! This year and every year to come. *TIP- Let dry flat overnight on a nonstick surface for the best shape. Try this craft with just your little snowflakes or make it party with a large group! We are making this with Brinkley's Brownie Troup and I know it's going to be a hit and create memories for years to come. My kids are OBSESSED with the little surprise eggs that our local market sells. Everyday after school they want to go and get one and they barely eat the candy and but they love getting the surprise inside. But they LOVE getting the surprise and breaking open the chocolate. So this Halloween I wanted to make them a little surprise just for them with this DIY Jack-O'-Lantern Chocolate! 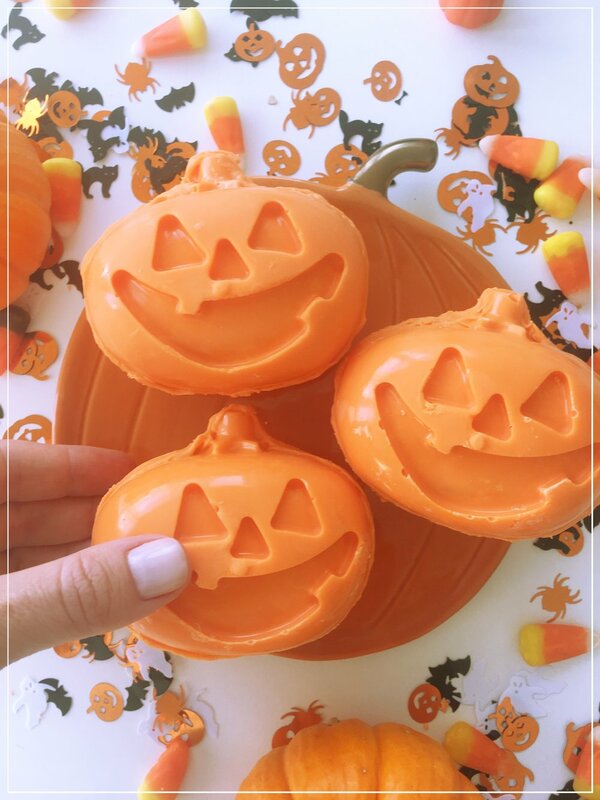 I love surprising the kids with fun treats and this Halloween I decided to make them an exciting dessert that they won't forget! And every halloween season I have a ton of it around the house. And they ask for it for dessert almost every night. It's a good bargaining trick to make them eat all their dinner! So filling the chocolate with candy corn was not only festive but also something I know they'd love. Your kids not a fan? Don't worry you can try any Halloween themed candy that they love. First you'll want to wash and prepare the molds. Make sure that the mold is clean and dry before starting. Then you'll need to melt the chocolate chips in a bowl. I just microwave the entire bag for 60 seconds. Then stir. And if needed I will do a another 20 second increments until it's totally melted. Don't over heat the chocolate!! It's better to melt slowly than to burn the whole batch! Then you will carefully fill each mold. The trick is to make sure the chocolate is not super runny when filling the molds since you will need scoop out the middle. Once the mold is full, you'll need to shake out the mold to remove any air bubbles. Pop the bubbles with a toothpick or the tip of a pointy knife. Then spread the inner chocolate out to the sides shallowing out the middle of the pumpkin shape. You can use the back of your spoon to do this. Making sure that the sides are as thick as the middle section of the pumpkin shape. Let harden for about 1-2 hours. You can leave longer but don't rush it! The center takes the longest to harden and you won't know it's not completely hardened until it's too late! So be patient! Once the chocolate hardens you can carefully remove the shapes from the mold. Place a small handful of candies into one side of pumpkin shape. Then melt a second smaller batch of chocolate chips. Fill this melted chocolate into the piping bag or zip lock. Place two sides together with the candies inside and carefully bond the two together with the melted chocolate. Wipe any excess off with your finger or the back of a spoon. Let harden again for at least an hour and then enjoy! The kids were so thrilled to get their chocolate Jack-O'-Lantern dessert!! 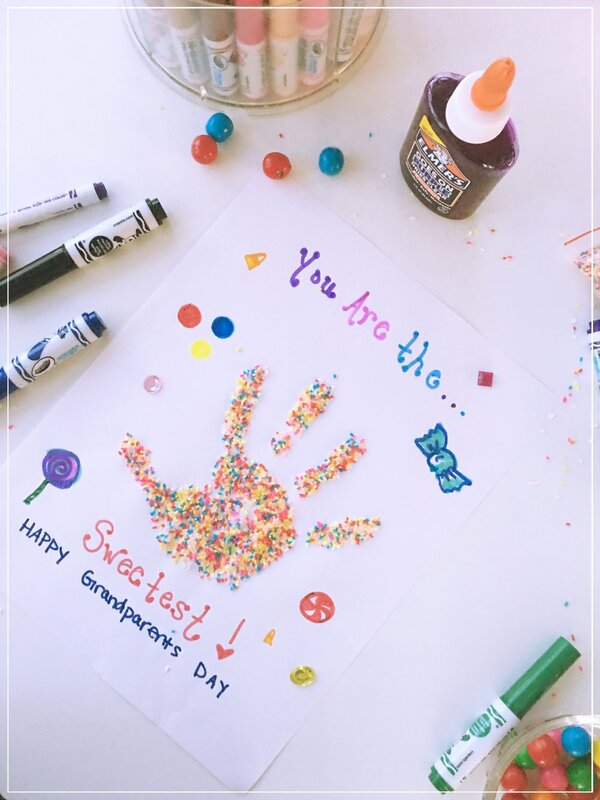 Super Sweet DIY for Grandparents Day! Nothing is more important than making grandparents feel special and this day is here to celebrate them! Everyone loves grandma and grandpa and this adorable surprise will let them know how sweet they are. They will love receiving this special keepsake from their beloved grandchildren. And will enjoy it for years to come! Simply start by adding a quarter size amount of glue on the palm of the child's hand. I love the purple glue by Elmers because it lets you see where you are putting the glue and dries completely clear! Then have the child place their hand on a piece of paper leaving there pint sized handprint on the paper. Drizzle on the faux sprinkles and let sit till dried. *If you don't have faux sprinkles try using glitter or actual sprinkles or nonpareil sprinkles. However real sprinkles may loose color or fade over time. 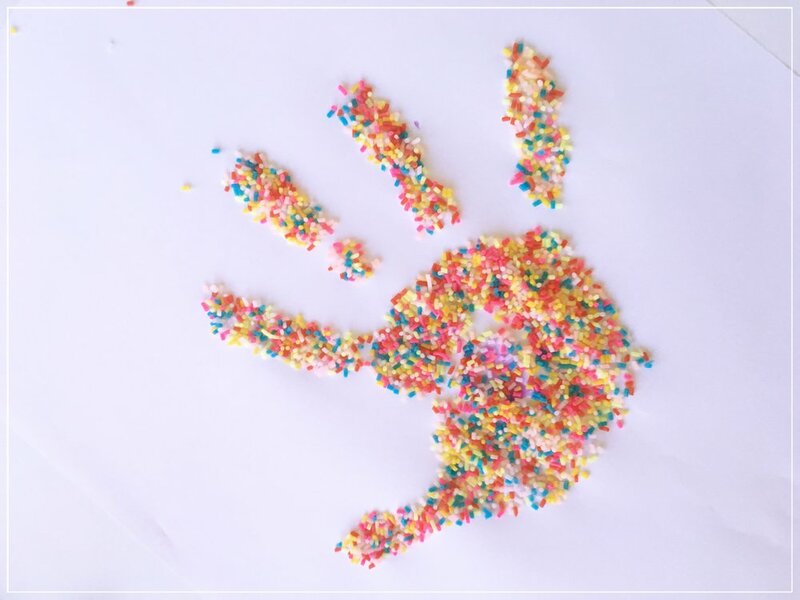 Shake off the remaining sprinkles to reveal their tiny little handprint made out of sprinkles. Finish by adding a loving message and decorate. We used markers to draw candy and added jem stone stickers to really make this sweet surprise! 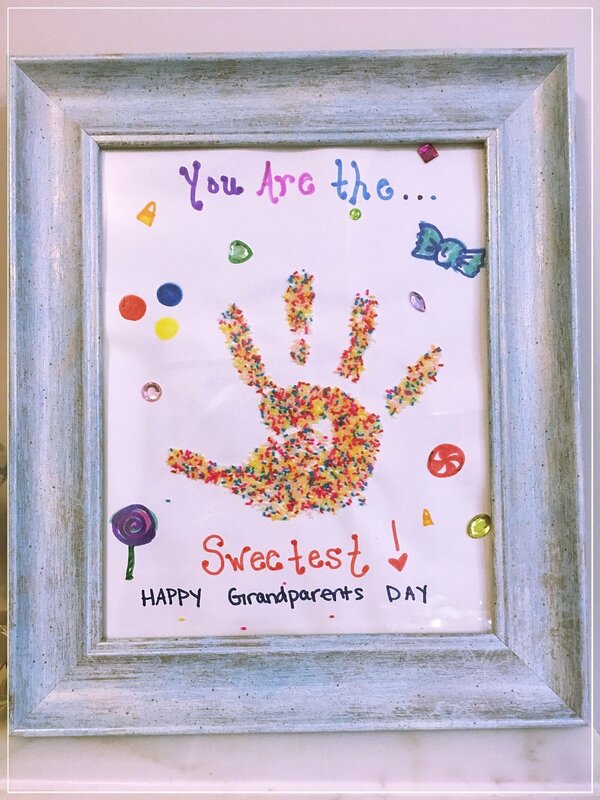 This craft is super simple and I know all the grandparents will just love seeing how much they are cared for on this Grandparents Day! We transformed this notably icky and gooey yucky stuff into the most magical princess slime that will leave your little ones in awe. I just love making all types of fun crafts with Brinkley and even my boys love playing with this stuff. But today we really wanted to make it special with a princess fairytale theme. So what better way than to create something pretty (well, that may be a bit of a paradox!) and girly than with glitter fairy-dust!! I really think this may be the prettiest slime I've ever seen! 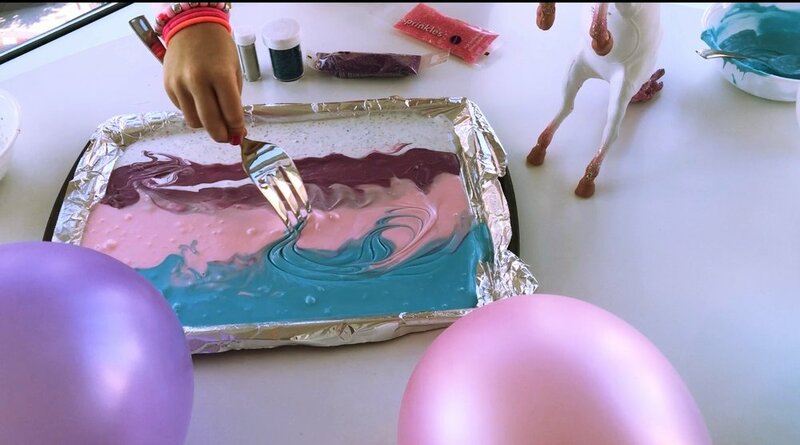 Check out how we created this whimsical DIY slime. We love this recipe the best! It is by far the most kid friendly recipe we have tried (and we have tried them all)... 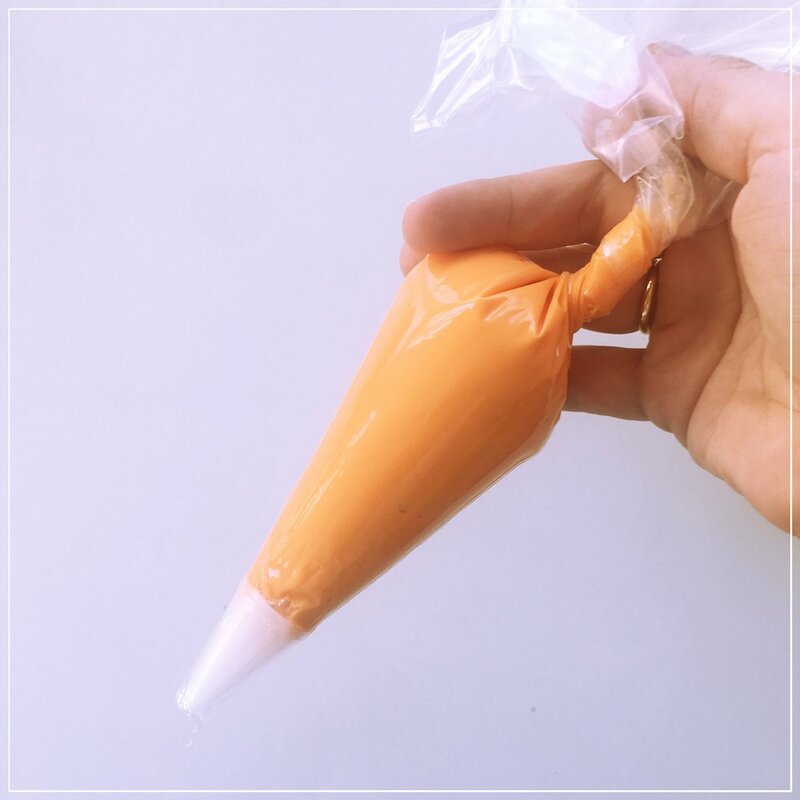 There are so many ways to make slime but this one is a no brainer and turns out great every time. It has the right consistency and doesn't harder over night which a lot of the other recipes have done. I like the contact solution formula much better than the borax versions. The borax versions I've tried have always come out more like gack or flubber. And for those of you who may not know what the difference is well, it's really just that slime is easier to pull and play with. Gack/flubber just kind of wiggles and around and is more dense. I hope that helps but definitely let me know your thoughts and other recipes below in the comments section! Would love to try them out! Here we have taken all the colors and lined them up to create this gorgeous pattern! 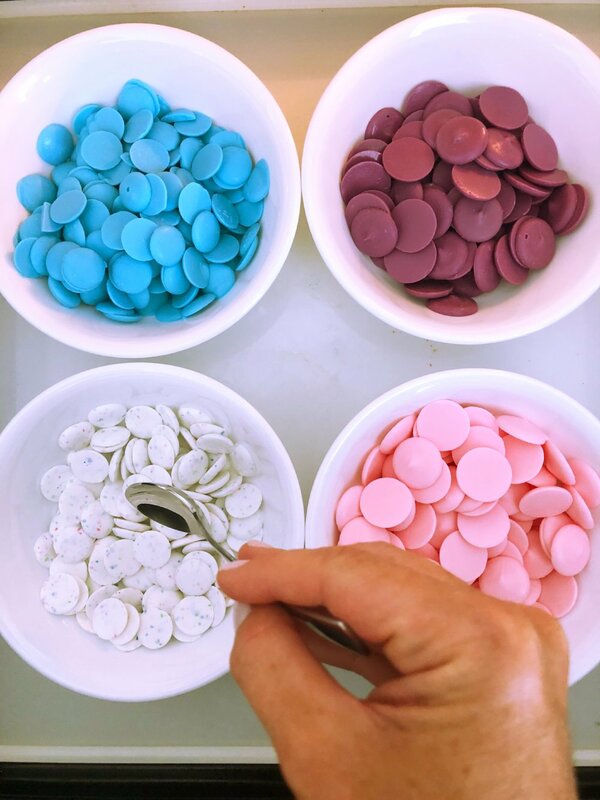 The kids will love mixing and combining the different colors. It reminds me of the old fashioned candy pulling that fascinated me as a kid!! TIP: Have a boy at home or a not-so-girly-girl that may not be into this pink fairytale slime? Well, simply switch out the pink for blue and add stars instead of hearts and you have a great galaxy slime recipe that I am sure will impress! Make a spark this 4th of July with this amazing DIY Red, White & Blue slime! Liven up any holiday get together with this super simple and fun DIY that the kids and adults will be talking about all summer long. Slime is all the rage right now, especially with my little ones. We love mixing and making all types of crafts and concoctions. So slime making has become the go to playdate of choice! In this DIY we combined regular glitter slime with foam slime for the ultimate effect! I will show you how to make this icky sticky gooey stuff and transform it into the prettiest mix of colors that may even make you want to get your hands dirty! It is really very simple and your little ones will be in awe of the pretty colors and mixing this strange textured blob around for hours. Although, making it is just as much fun as playing with it! Once you have all the slime made, you can take a portion and line them up in the red, white and blue pattern! Enjoy watching the kids stretch, pull and combine the colors! Check out how easy it is and try this on your next playdate or backyard BBQ! It's sure to bit a hit! Father's Day DIY Surprise Balloons! My kids love making something special for their dad every year for Father's Day and this year they thought of writing him a letter to tell him all the reasons they love and appreciate him. How cute is that?!! So, what better way to present dad with these adorable secret love letters than to place them in these fun and exciting confetti filled balloons! Just picture delivering these beautiful balloons to dad this Father's Day! He will be so surprised and delighted to see what the kiddies have planned for him. And then the kids and dad can pop them together to reveal the surprise letters of admiration inside. I know any dad will just love this and remember it for years to come. Start with filling a single large clear balloon with confetti of your choice! I selected a light weight tissue paper confetti. It's colorful and will softly fall as the balloons get popped. Fill one for each child OR have your child write each reason they love dad on individual paper and fill numerous balloons! Let the sky be the limit with this unique Father's Day gift. Have the child/children write their letter on a small light-weight paper. I would NOT recommend something heavy or bulky like construction paper. Then, fill the balloons with helium for the ultimate impact! Don't want to buy a helium tank or pay to get them filled? That's ok too... The joy of popping the balloons to reveal a secret love letter is the point of this and a regular air filled balloon will be just as special. Dad won't notice the difference! Want to make this moment even more special? Have the kids read dad their letter. He will melt with love and appreciation as the kids share their special letters with him. We are all obsessed with the current snapchat filter of the beautiful festival flower crown and my daughter and I just love playing around looking at ourselves with these beautiful filters too! 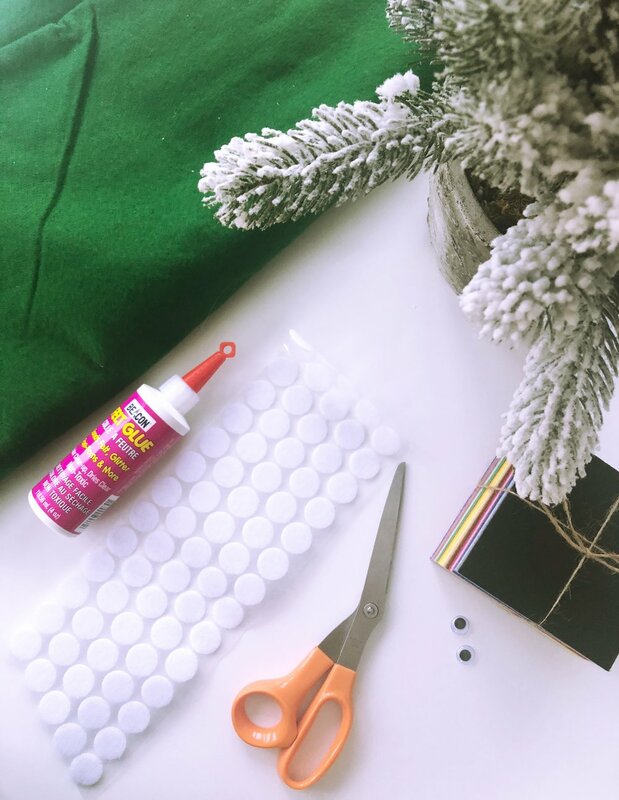 I knew we could make this filter come to life with this super simple DIY craft. And what better way to kick off the summer vibe than getting on trend with this ultra chic hair accessory. Dress up any summer BBQ by wearing this stylish flower wreath headband. First you'll want to layout your design and place the flowers in a way you'll want them before you glue them on. I used the larger peony flowers for my headband and I added a few of the leaves from the artificial flower arrangement do add more dimension to the design. After trying out a few mixes of roses and peony, I decided on my design and started gluing on the flowers and adding on where I needed. For Brinkleys' we started by added the cat ears using a silver pipe cleaner. I wrapped the pipe cleaner around the base of the headband a few times and then formed the cat ear by pinching the top to make a point. Then she chose the orchid flowers to decorate and that was it! After using the glue gun on many projects, I let her glue on a couple of the flowers by herself which she was thrilled about! I just warn that you help to hold the item on just incase any glue moves or drips in the process so the little hands don't get burned. It HURTS!! So be so super careful if you decide to let your child help in this process. Brinkley is 6 and does tons of crafts with me all the time and I trust her to a point but am always watching very keenly and never take my eyes of her during this process. Then we brought our items to a BBQ last weekend and they were a hit with all her friends. They all wanted one and loved dressing up and playing around wearing them. Make heads turn when your littles (or you... I won't judge!) rock this stylish summer trend!! 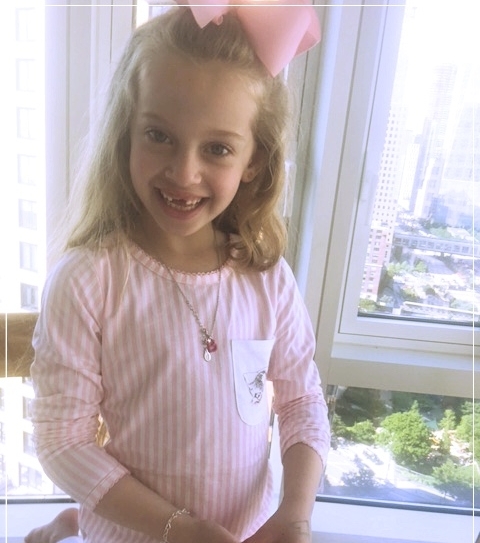 What better way to show mom you care than with this beautiful Mother's Day Craft! The kids will love creating this fun DIY craft and you will love cherishing it for years to come. Make it personal with a family photo or just use pictures of the kids like we did. Each child can make their own or they can join forces and make one together. 1. Start by tracing a vase shape on firm paper or cardboard. We used a piece of a cardboard box from one of our recent online purchases. 2. Then have them trace that shape onto a solid piece of paper. 3. They can paint around the shape as opposed to painting the vase itself giving a modern abstract look. 4. Add a personal family photo or individual pictures. I had them trace their faces out of a photo using a coin and then cut and glue on. 5. Then have your little ones use ribbon or draw a boarder onto the vase. 6. Once the paint dries you can help them glue on some dried flowers and artificial flowers. I love letting them mixing it up! If you don't have any dried or fake flowers around they can simply cutting out flower shapes or petals with tissue or construction paper. Or draw their own flowers on separate paper and then cut them out. I just love how it turned out! 6. It looks great as is, but by placing any of your children's artwork in a modern crisp white frame like this it will automatically elevates it to a piece of real modern art that you won't mind hanging the walls. But make sure the frame has room to accommodate the depth of the flowers. I used a shadow box frame. This can also be a great gift for grandma! Capturing a moment in time like this makes it a that much more special and important. What mom doesn't want that for Mother's Day?!! Creating something personal and honoring mom is the perfect idea this holiday! Brinkley, my 6 year old daughter was asking to dye Easter eggs weeks before spring had even sprung! What kid doesn't love dying Easter eggs, right?! Well, I knew I had to come up with another idea that would peak her festive & creative interest. Make your own natural colored playdoh and paint them using food coloring and water. Kids love mixing and stirring things and feeling like they are doing it all on their own. So I pre-filled all the ingredients with the correct amount and left it to my daughter to make herself! Then I layed out a few easter themed cookie cutters for her to make shapes with! Finally, we made our own paint by adding some food coloring and water. She was able to paint and decorate them any way she liked! Paint and enjoy the Easter Decor! We let them dry over night and then presented them in an adorable basket! They preserved beautifully for weeks! We live in the city and finding a semi-private place to do an easter egg hunt is challenging especially when the only outdoor space in my building isn't even open yet!! That is why I came up with this super fun idea for my kids. No worrying about finding grassy area and just as much fun for them! Plus, the kinetic sand lasts for a long time and you can keep to play with another time. I love putting it out on playdates and letting the kids enjoy the fun texture. My kids are currently obsessed with Pokemon and Shopkins which are perfect to place inside a little tiny egg. I didn't want to use candy because I know they'll be getting so much of that from the Easter Bunny. Start by emptying the kinetic sand into the bowl or bin of your choice. Make sure there is room for them to move the sand around without it spilling over the top. This large bowl used is very deep and was perfect for this DIY. However, using a plastic bin would work well too. Another option is to try a beverage tub or even a large plastic bucket would also work well. Then, place the Shopkins and Pokemon figurines into the small easter eggs. The Pokemon toys we ordered were already in an egg so that saved me a step! 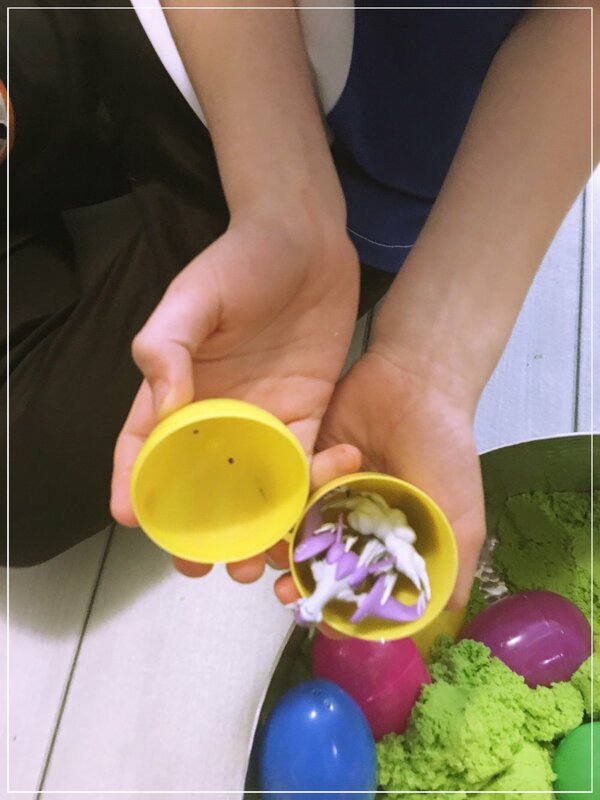 Then cover the eggs deep in the sand and let the kids enjoy searching for them though this thick magical sand that feels like wet sand from the beach. It is easy enough to dig through but harder to find things in as it is denser than regular sand. It is similar in density to brown sugar, just incase you have never touched it. It really does stimulate the senses and can really be soothing to play with. The kids will love this activity this Easter Season. Want to do this with the kids but don't want to spend a ton? Try using items the kids already own to put inside the eggs. They will have just as much fun hunting or digging for eggs and discovering what items you have hidden in them! Or try adding loose change. The kids will love adding the coins to their piggy banks. See what they discover this Easter with this unique Easter Egg Hunt experience!! I know they'll love it. Leave your comments or questions below! We all know how hard it is to get our hand on an actual Hatchimal, so I decided to take things into my own hand, literally! Carefully pull out the plastic liner on the top half and leave the tin foil in the base (this will give your egg structure to hold the items you will be putting inside! Then, let the kids enjoy hammering the egg open to find their surprises! 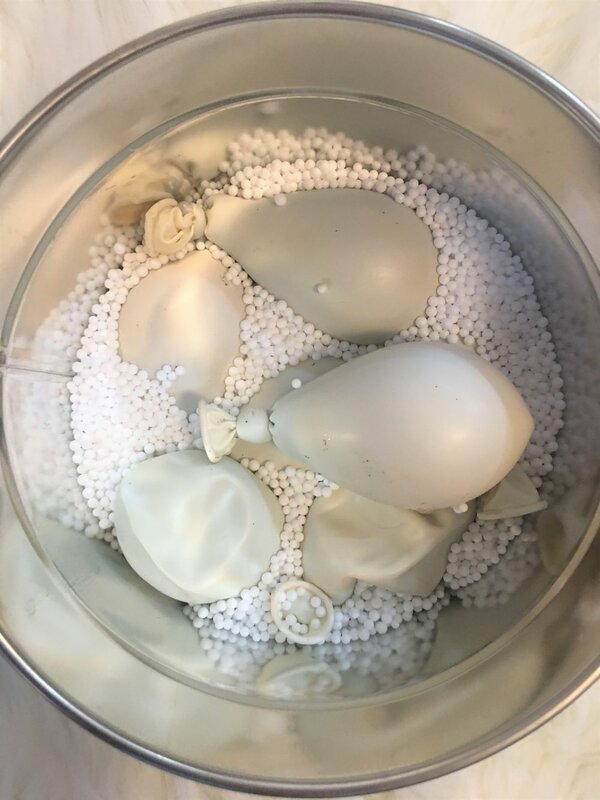 My kids helped me make the egg and knew what what was inside but that didn't stop them from having a blast with destroying the egg and finding the items inside! There are many holiday's that the kids have off from school. But this President's Day, make time to teach them by having them do a fun DIY Craft dedicated to educating them about what this holiday really stands for. Washington's Birthday, or better known as President's Day, happens every year on the 3rd Monday of February. It's to honor the first president of the United States, George Washington. However, it's to honor and remember all the presidents. I wanted to make sure that my kids understood the importance of this day and to recognize that it is not just a day off from school but a day where we look at the history of our nation. My older son, Brycen, really loves the presidents and probably knows more than I do about them and when they served. Studying can be fun and here is how we will be celebrating this President's day with this fun DIY craft of all the American Presidents.